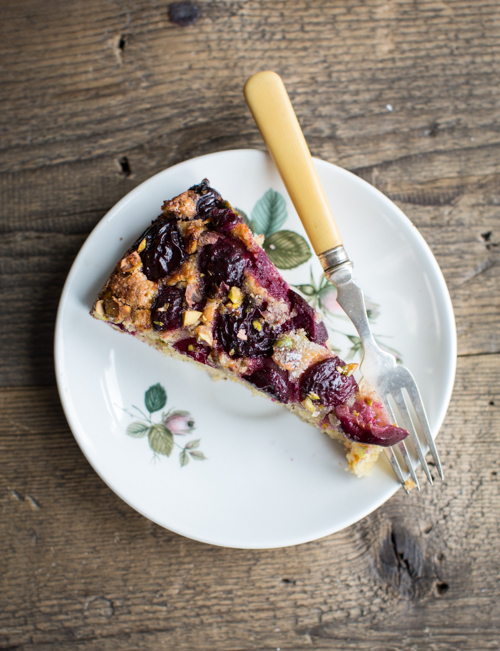 Summer baking is a wonderful thing, just think of all the heavenly fruits we get at this time a year – perfect to make the most delicious cakes and bakes. So, as soon as there’s a day when the temperatures drop to bearable, I turn on the oven and dig around my recipe collection for summer baking inspiration. 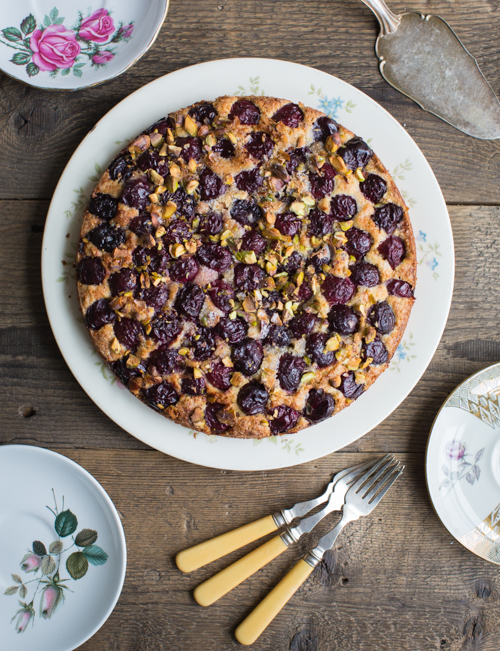 This beautiful cherry pistachio cake is spiced with fragrant cardamom, which imbues it with a lovely middle-eastern flavour. 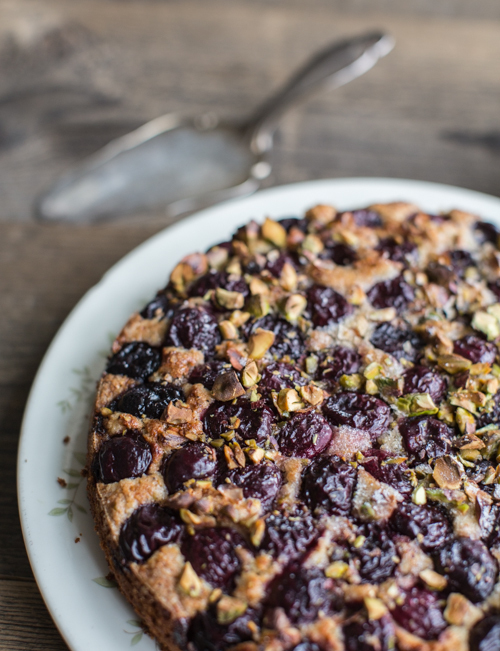 It’s a very simple cake that’s super quick to throw together and that makes the best of the season’s cherries. Enjoy! Put 70g of the sugar, the brown sugar, ground almonds, 30g of the pistachios, the desiccated coconut, the flour, baking powder and salt into a large bowl and mix. Crush the cardamom pods in a pestle and mortar, discard the shells and grind the seeds into a fine powder. Add to the dry ingredients and mix. Add the butter and the eggs to the dry ingredients and beat into a smooth batter. Line the base of a 23cm springform with baking paper and pour the batter on top. Cut open all the cherries, remove the stones and distribute the cherry halves over the batter. Sprinkle with the remaining 20g pistachios and the 10g sugar and bake in the preheated oven for 35 minutes. 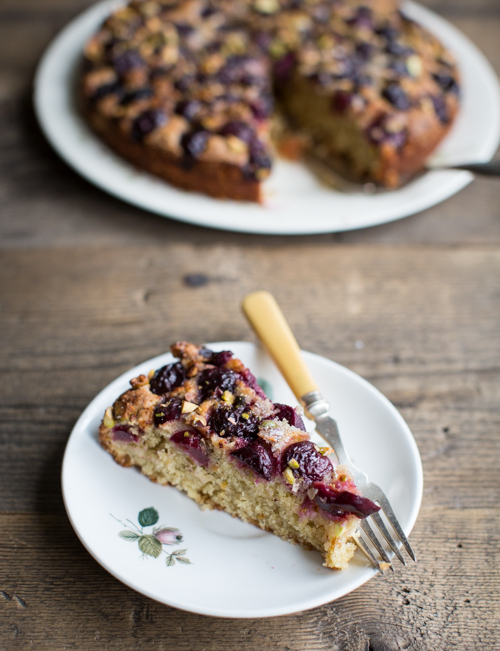 Allow the cake to cool in its tin, remove and serve each slice with a dollop of yoghurt. TIP: You could swap the cardamom for ½ tsp of cinnamon to infuse the cake with a subtle cinnamon flavour instead.